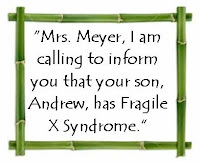 This week's Fragile X Writer is an inspirational mom and blogger friend of mine - Kristie Meyer, of Life with My X Men. Kristie and I met for the first time in Miami too, although I felt like I already knew her and her family, being a devoted follower of her blog. Her two sons with Fragile X - Drew and Blake - are a couple of years old than Zack and AJ, so sometimes I feel like I might be reading about our own future possible experiences, our own progress and joys and challenges, when reading about Kristie's families adventures. The following is the story of how she first found out about Fragile X.
I was married to Eric in May of 1999. Six months later, I was pregnant and thrilled. My sister, Kelly, was also pregnant at that time, about three months ahead of me. My niece was born in April of 2000, and Drew was born in July of the same year. Kelly and her husband, Tony already had a son, Kyle. He was two and a half and developmentally delayed. He was already in early intervention services, but had no official diagnosis. He had some disturbing behaviors like head banging and a lot of angry outbursts. They had taken him to see many doctors and had been told that he was “too social” to be considered autistic. Their search landed them at Cincinnati Children with Developmental Disabilities. They did a whole workup on him, from speech evaluations to physical exam and genetic testing. A month or so after Kyle’s initial appointment, Kelly had a follow-up meeting to discuss the results of the tests. There was a geneticist there and she told Kelly that Kyle has something called Fragile X Syndrome. I was with her at this appointment as were Kyle and our babies. The geneticist said that Fragile X was a genetic disorder and asked about our family. We told her that I am Kelly’s only sibling. She said that our babies were at risk for having this and we should have them tested as well. Drew was six weeks old at the time. We had his blood drawn and waited about six weeks for the results. On October 27, I got a call from the geneticist’s office. They said, “Mrs. 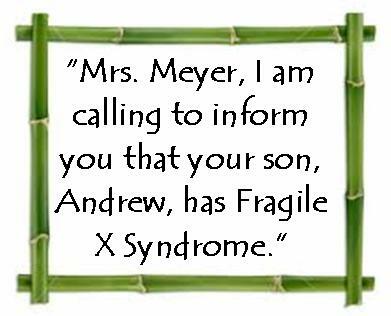 Meyer, I am calling to inform you that your son, Andrew, has Fragile X Syndrome.” It was the call that changed our lives. I told Eric and cried on him. He just held me and said we’d be okay. As it turned out, both my sister's and my new babies tested positive for Fragile X. Telling extended family was a painful experience. Our parents were very supportive. My mother-in-law told me that God must have thought we were pretty special to give us such a special boy. I knew she meant well, and now I can see that it was said in love and to comfort us, but at the time I didn’t find comfort in her words. I didn’t really want to be chosen for this special gift. We had extended family who said very hurtful things when they learned of it. Thankfully, most were supportive. ﻿﻿﻿﻿ A month after diagnosis, my sister and I went to a Fragile X conference in Cincinnati. We spoke with Dr. Hagerman and she was delighted to learn of Drew’s FX diagnosis. She said they didn’t have many infants who were diagnosed and asked if we’d participate in a research study. We did and it was soon revealed that Drew was a mosaic of Fragile X Syndrome. This meant that some of his cells only carried a premutation and in theory, would mean he was less affected than some kids with Fragile X. We enrolled Drew in early intervention services. The people there were wonderful. It was completely overwhelming to take him twice a week for early intervention, or Wee School, as it was called. I remember telling the intervention specialist that Drew being a mosaic of Fragile X would hopefully mean he wouldn’t ever be classified as mentally retarded. She smiled at me and said, “That is great. I hope you are right.” As it turns out, I wasn’t right. Drew is pretty significantly impaired by Fragile X. But I think I needed to hang onto the idea that he might not be too affected to deal with it at the time. Almost three years later, we had Blake. He was not planned by us. He was, however, planned by God. We thought we would be doing Drew a favor by not having any more children. We wanted to focus our attention on him and give him everything he needed. But God knew Drew needed a playmate--someone who was more outgoing than him and would draw him into new experiences. Blake also has Fragile X Syndrome. We received his diagnosis when he was about six months old. We were participating in a research study with Drew at the time and when Blake was born, we had him tested as part of the study. We weren’t too surprised with the results and enrolled him in early intervention services right away. ﻿﻿Now, it is twelve and a half years later and we are doing very well. I am not going to say that it has been easy. It has not. But it has been an experience that has bonded us together and has built our faith in God. Eric and I know we would not be where we are today without the Lord’s help. We are teaching our boys to love Him, too. A Fragile X diagnosis caused us to change our dreams and expectations. There are still tears sometimes, but what we have is a rich life full of love and laughter.